I loved it! It was so easy to make and taste so good!! 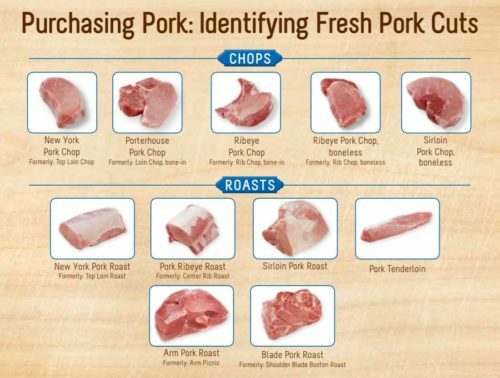 Wow, such a wonderful way to prepare pork. So soft and tender! This looks so easy and so flavorful! I cannot wait to try it! Well I know what I’m making for Christmas now! This came together so quickly! Great dinner! HI!! Newbie here..So I have a 2 1/3 lb pork sirloin boneless roast. I don’t have apple juice..can I just mix chicken broth with water? Also should I lessen the cook time since it’s a wee bit smaller? 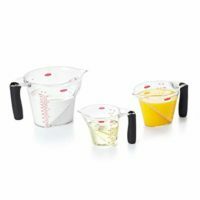 Hi Heidi – yes, chicken broth and water, or even just chicken broth would work well in this recipe. I would try 20 minutes with your roast. Enjoy! 6 qt … and I used this recipe this evening. cooked 2 if the Costco Pork Sirloin Tip Roasts about totaling about 6lbs … I had plenty of room for them . I set my cooking time at 23 min …. and followed your directions for alowing 5 min before performing quick rlelease of pressure…. It was wonderful! Held its shape and sliced like a dream! No pink! I didn’t have any apple juice so sliced up an apple to give it the flavor….. We loved it! Thanks! That’s great – thanks for sharing Dotty! I only have 1 of the Costco pork loin roasts left. I’m going to follow your lead since I have lots of apples from my tree, and also dial down to 20 min for only 2 lb roast. Thanks to everyone for great ideas. I cooked two of those Costsco roasts in my 8qrt instant pot and the 25 min cooking time was perfect. I have a 2 lb pork loin boneless. 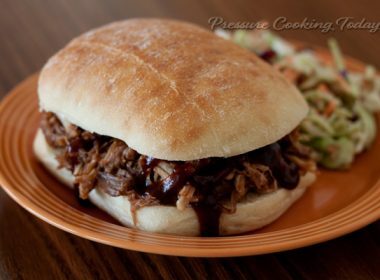 Trying to compnvert a recipe from slow cooker to my pc xl. 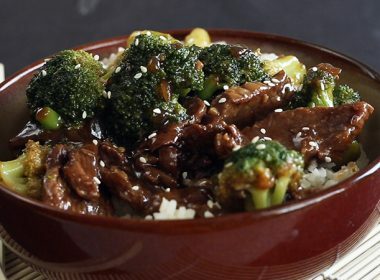 It calls for soy sauce, balsamic vinegar and brown sugar plus water and spices. Do you think I can just dump everything in after browning and set my time. Their recipe calls for making a sauce with the brown sugar and vinegar after cooking. Also using apple juice that I have in the freezer. I was worried about the brown sugar sticking or burning in the bottom. 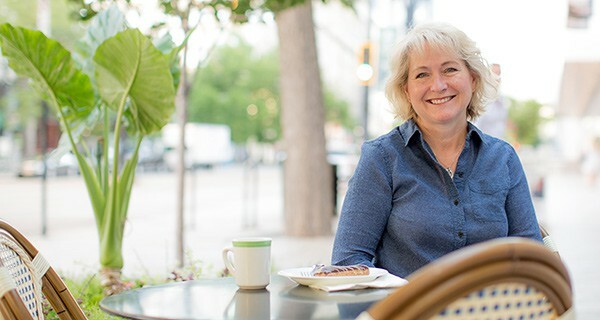 Hi Jane – as long as you have plenty of liquid, the brown sugar will not be a problem. This was fantastic. So moist and flavorful. My roast was just over 2 pounds so I decreased time to 20 minutes. The temperature was perfect, although I honestly prefer it to be slightly less pink in the middle. We served from the outside and stuck the inside slices on low saute setting for a few minutes while we ate. It took the pink right out (and soaked up tons more flavor). Thanks for sharing Midge – I haven’t had any experience with Caraway seeds. 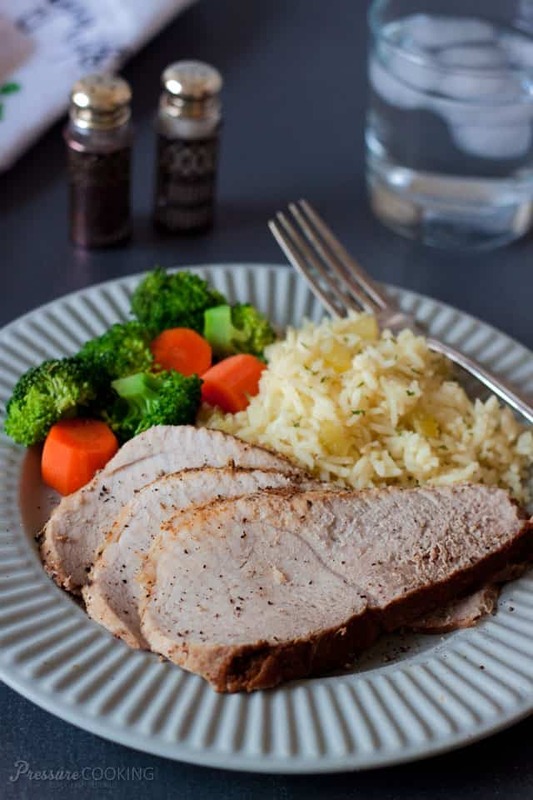 How long to cook a plain simple pork loin in juice from sauerkraut? I don’t want all the extra ingredients nor fancy meals. Hi Wanda – the cook time will be the same in the Crockpot Express. If you want a sliceable roast I would use this cook time. 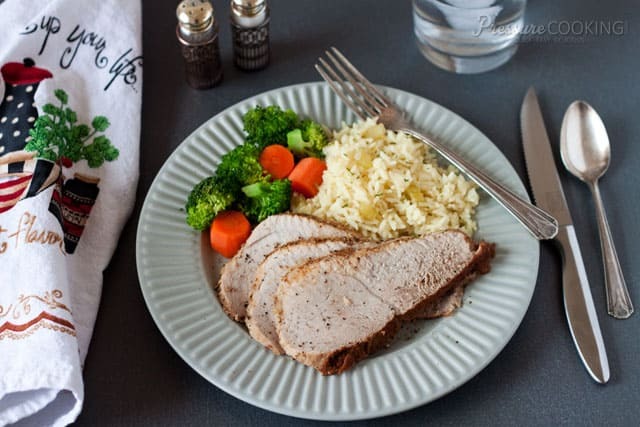 If you want a fall apart tender roast, you’ll want to double the cook time – depending on the size of the pork loin. What pressure? I have a Power Cooker and not the Power Cooker XL brand. I almost always use high pressure. But what pressure. I think the default setting is 20. 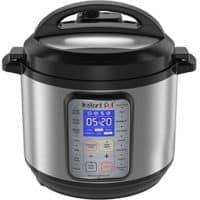 Hi Daniel – the pre-sets cook at 70 kPa which is about 10 psi – which is high pressure on the Instant Pot and most other pressure cookers. My pork sirloin roast is bone-in. Your cook time will probably be the same with a bone-in sirloin roast. 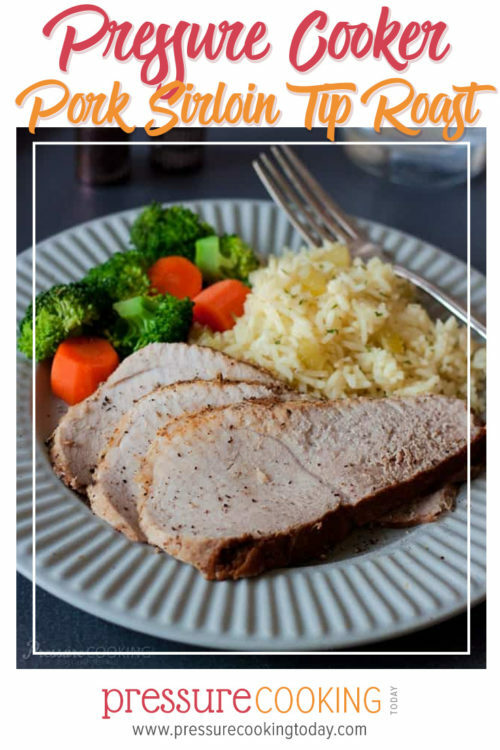 I’ve just purchased an InstantPot and want to make this pork roast for dinner tonight. It is still 90% frozen. 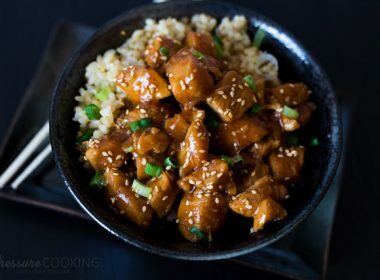 My InstantPot is not a locking one, so i am i sure on how to use your recipe to make mine! Help!?!?!! Congratulations Christine! I just mean turn the lid to the locked / closed position. You won’t be able to pressure cooker unless it’s closed. For a big cut of frozen meat, you’ll want to add about 5 minutes per pound. 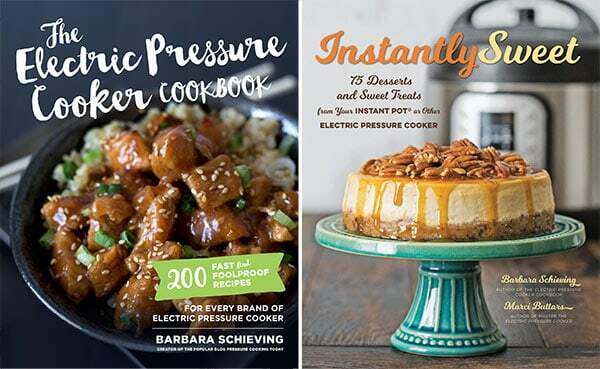 Here’s my getting started post https://www.pressurecookingtoday.com/getting-started-with-your-new-electric-pressure-cooker-or-instant-pot/ Have fun! That’s great Chris! Thanks for sharing. Sounds delicious. I have a combo pressure/slow cooker but have never used the pressure cooker mode – makes me nervous as heard stories of my mother-in-law having hers explode!! Any idea if your recipevwould work on slow cooker mode? If so, how long would you cook it on high or on low? Thanks! No apple cider or juice in the house. I got beer though… Possible substitute? Hi Angella – I haven’t tried it, but others use beer as a cooking liquid all the time in the pressure cooker. Hi! 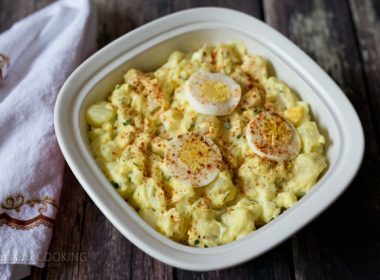 I made this recipe the other day in the instant pot, my new favorite toy, and it came out delicious! My husband and kids all loved it. I made two of the Costco Pork Sirloin Tip roasts in an 8qt instant pot. The only thing I added was a little bit of cinnamon. 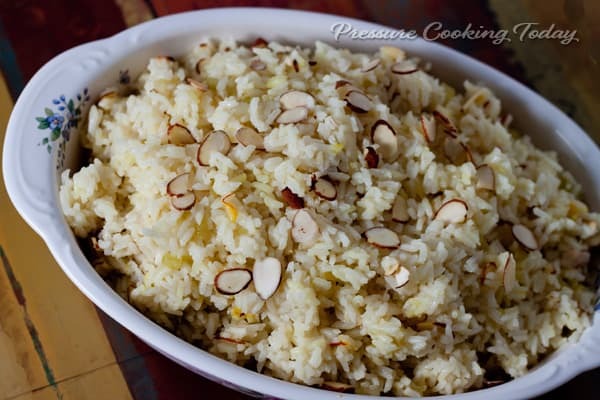 Thank you so much for posting this recipe. It is one of my new favorite foods to make. Thanks for sharing Brenda – nice to know that 2 roasts will fit in the 8 quart. So glad it was a hit with your family. Cinnamon sounds like a delicious addition. Hi… How long did you cook the two sirloins? Thank you!!! Hi Jen – hopefully, Brenda will check back in. But generally, the cook time of meat in the pressure cooker is determine by the thickness of the meat and not the volume. So there should be no need to increase the cook time as long as your are using 2 3 lb. roasts. Hello. I have a frozen 3ish pound pork roast I want for dinner tonight. 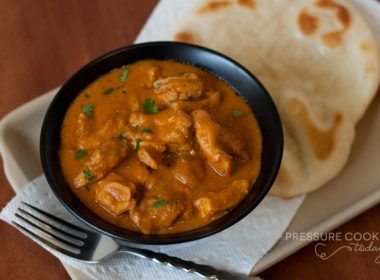 How long should I cook it for in my pressure cooker? I’m new to this pressure cooker thing…so far, ireally like it. Thank you in advance. Hi Alicia – I assume it’s a pork loin roast? If you want it sliceable like this sirloin roast, then I’d use the same or slightly less time if it isn’t as thick as the sirloin roast. Have fun! I can’t help but wonder if she was asking how long to cook the roast from frozen. Times don’t change due to meat being frozen. It will just take longer to come up to pressure. 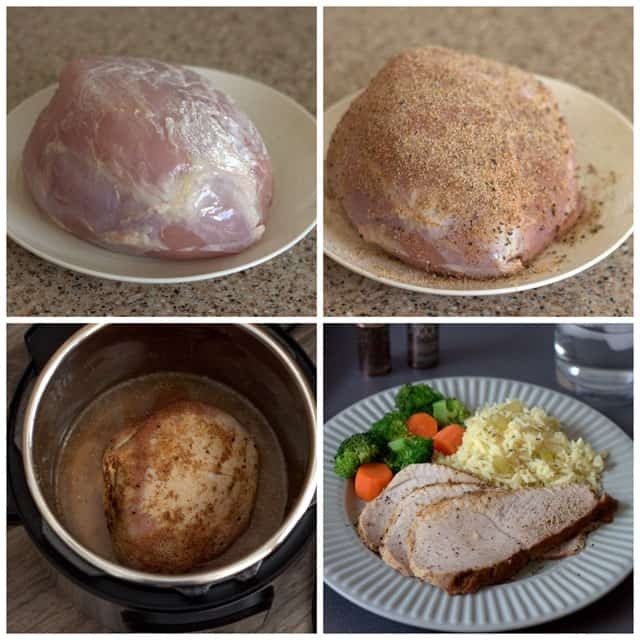 For smaller items, like chicken breasts, you don’t need to add additional time, but a big roast like this one will need additional time when cooking from frozen. How much additional time depends on the thickness of the meat and how solidly it’s frozen. For every inch of thickness you’ll need to add 5 minutes for a roast.